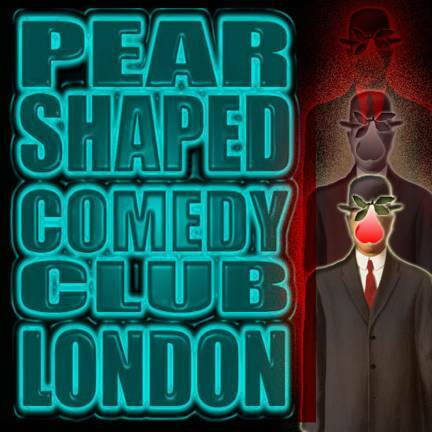 Pear Shaped In Fitzrovia – London's Second Worst Comedy Club - offers comics (new and old) the chance to perform in a friendly non competitive atmosphere. All acts perform a five minute set, apart from the headliners – one at the end of the first half and another at the end of the evening . New acts try out old stuff and old acts try out new stuff. Quality control is not an issue at Pear Shaped. The object of the evening is to have FUN. This may seem an unusual concept in the serious world of comedy which is why MCs Brian & Krysstal and Anthony Miller are there each week to ensure that fun is had whether you like it or not! Banjo player extraordinaire Al Mandolino does his best to avoid playing a recognisable tune of any kind thus making the interval a fascinating if extremely un-musical experience. He has thus far been highly successful in his lack of endeavor. 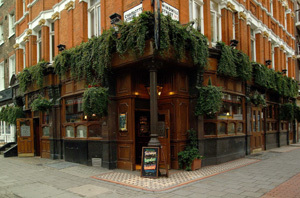 16a Charlotte Street, London W1T 2LY. TO FIND OUT WHO'S ON. How about this for a review? Living Legend - master of the unexpected is apparently still alive in another dimension somewhere near Bournemouth. Al Mandolino actually makes mandolins - but chooses play banjo – mostly out of spite. You�ve heard of the lost chord – Al is a man in search of the lost tune. He has been searching for years and sadly still hasn�t managed to find an actual tune of any kind. Maybe one day his dream will come true. Pear Shaped my arse, whats wrong with Banana Shaped?